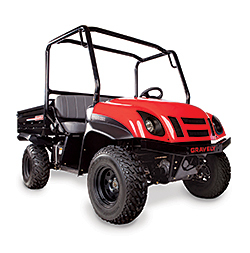 The Gravely Treker is suitable for use on sports fields, campuses and a variety of other sites. With a 22hp, 653cc Subaru® engine and a 1,000-pound bed capacity, it is available in two- and four-wheel drive models. Other features include: auto-locking differential; 10.25-inch ground clearance; 25 mph forward groundspeed; all-terrain tires; 8-gallon fuel capacity; and LED headlights. The electric bed lift is standard and allows users to more easily deposit payloads.